Continuing professional development (CPD) is the means by which employees improve, maintain and broaden their skills through training and by gaining further qualifications. HR Software can help managers to track and monitor their employees continuing professional development and ensure that objectives are achieved. Empresa's training and qualifications features help track training courses completed by employees, identify skills gaps/training needs, match skills with needs for promotion opportunities, store vital training documents and send notifications to employees booked on a course. Manage your employee's qualifications and training development - a feature few HR software packages can offer. Schedule and cost training courses for your employees. Manage employee repayments for training costs. Set notifications to remind you when an employee is starting or finishing a course. See who is enrolled on which course at any time. Quickly see any skill gaps that need addressing through training. Manage which training companies are providing which courses and at which locations. 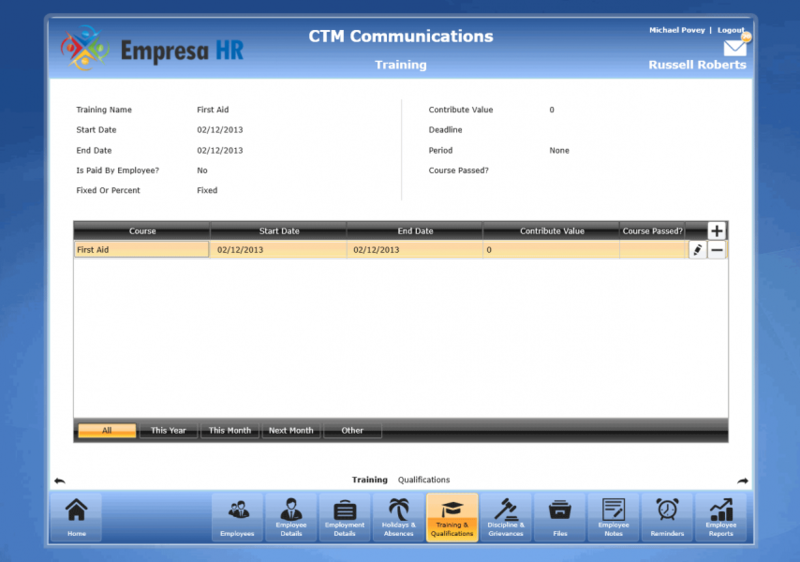 Empresa HR also records trainers and providers, including contact details and events they have completed. Keep track of all the information required to run your organisation's HR including qualifications and training documents.